A University of Arkansas at Little Rock history professor and his graduate students are making headway into a mystery 99 years in the making. Dr. Brian Mitchell and his graduate students in the Intro to Public History Class have followed a trail of clues through cemeteries, public records, and databases as part of their search to discover what happened to a dozen black men wrongfully sentenced to death in a time of great racial turmoil in the aftermath of the 1919 Elaine Massacre. 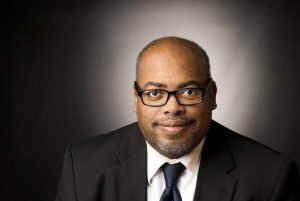 With the centennial anniversary of the Elaine Massacre quickly coming up next year, Mitchell has devoted much of his recent research to uncovering the mysteries of one of the deadliest race riots in U.S. history. Graduate students working on the project include Kathryn Bryles, Jessica Chavez, Kary Goetz, Andrew Mcclain, Jessica Parker, Alex Soulard, and Kathryn Thompson. The Elaine 12 were a group of black sharecroppers who received some of the harshest sentences from all-white juries in the wave of quick, unjust criminal prosecutions of black people that followed the Elaine Massacre. The men were convicted of murder and sentenced to death. This led to the events of the Elaine Massacre. In September 1919, representatives of the Progressive Farmers and Household Union of America met with approximately 100 black farmers at a church to discuss unionizing. When a group of white men interrupted the meeting, two white men were shot. The sheriff organized a posse. A mob of an estimated 500 to 1,000 white people stormed through Phillips County, killing black men, women, and children on sight. The convictions of the Elaine 12 were overturned in the landmark ruling, Moore vs. Dempsey, by the Supreme Court in 1923. One of the key pieces of evidence, according to Mitchell, was the testimony of white men who participated in the Elaine Massacre. Following their release from prison, most members of the Elaine 12 fled the state and changed their names. Many of them lived the rest of their lives in exile, fearing for their safety, with their family members never knowing what happened to them. Through their diligent research, Mitchell and his students have discovered the location of six graves of the Elaine 12. Graves were found in Kansas, Illinois, Missouri, and Ohio. Only two of the six graves are located within the state of Arkansas. 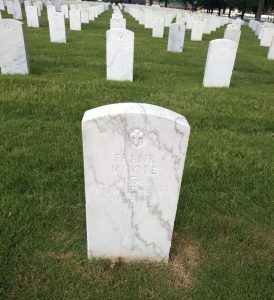 Frank Moore, a World War I veteran, is buried in the National Cemetery in Little Rock. Joseph Knox also is buried in Arkansas at the Haven of Rest Cemetery in Little Rock. UA Little Rock graduates Laura Fuentes Whitehead and Deanna Holdcraft, officers in the Arkansas Archeological Society’s Central Arkansas Chapter, assisted with the project by spearheading the ground research in cemeteries with students and helped with professional outreach and online data entry for grave information. They also served as subject matter experts in regard to the area’s cemeteries. Frank Moore’s grave is located in the National Cemetery in Little Rock. Mitchell also is raising money through a foundation, Finding the Elaine 12, to place markers on the graves of the Elaine 12 and historical markers in the cemeteries where they are buried. The foundation has already raised more than $8,000. Donations can be made online by selecting College of Arts, Letters, and Sciences in the drop down box and then typing in “Elaine 12” in the Fund Other box. Checks can be made out to the University of Arkansas at Little Rock with “Elaine 12” written in the descriptive information line. 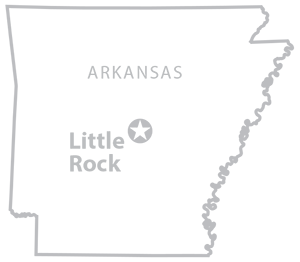 Checks can be mailed to University of Arkansas at Little Rock, Office of Alumni and Development, 2801 S. University, Little Rock, AR 72204. Mitchell and his students are creating comprehensive biographical profiles on all members of the Elaine 12, which they will submit to the Encyclopedia of Arkansas for publication. Through a partnership with the UA Little Rock Department of Theatre Arts and Dance, theatre students will use the profiles to create vignettes of the Elaine 12 that will be used in a play during the 2019 centennial commemoration of the Elaine Massacre. In the upper right photo, Dr. Brian Mitchell and his graduate students meet with historians and family members to learn more about the Elaine Massacre for their research project on the Elaine 12 for their Intro to Public History class. 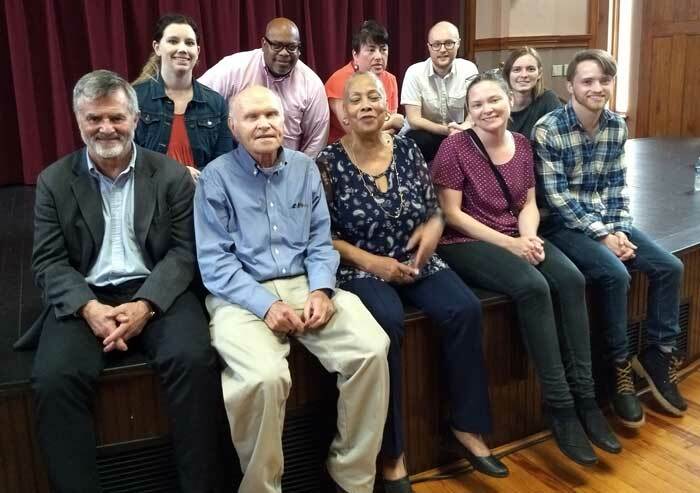 Front row (L to R) includes Robert Whitaker, author of “On the Laps of Gods,” Grif Stockley, author of “Blood in their Eyes,” Shelia Walker, family member of Albert and Milligan Giles, sharecroppers arrested during the Elaine Massacre, and graduate students Jessica Chavez and Alex Soulard. Back row (L to R) includes Dr. Jessica Parker, Dr. Brian Mitchell, and graduate students Kathryn Thompson, Andrew Mcclain, and Kathryn Bryles.